Casa Felice is unique for a property located in the historic Centre of Barga Vecchia in that in addition to its own two private terraces with views of the Duomo, the property also enjoys the tiered communal grounds of Parco San Felice,the gardens of the adjacent Church,with its shaded pergolas and large garden patio that sometimes hosts a band during the Festa in July. The winding lanes of the old town are adjacent the property and you can meander from the nearby ancient gate of Porta Macchiaia along Via di Mezzo and into the historic Piazzas with their restaurants, galleries and shops to Porta Reale at the other side of town. A climb to the Duomo (9th Century Cathedral which dominates the town) reveals breathtaking, almost unbroken 360 degree view of the surrounding hills and valleys. A large park divides the hilltop from the lower part of town known as Barga Giardino. Il Giardino is bustling with shops, cafes and restaurants and boasts a weekly market every Saturday morning. My wife Anne and I have been married for over thirty years and have three daughters all of whom enjoy holidaying in Barga. We live in Scotland and have made many new friends, both locals and holiday makers during our many visits to Barga. After a holiday in Florence in 2002 we returned to Italy the following year to explore Northern Tuscany and came across Barga by accident. We fell in love with Northern Tuscany and returned for the following three years to the Garfagnana Region basing ourselves in places like Castelnuovo and Villa Collemandina allowing us to mix rural retreats with town or village life. We found the region had so much to offer and was well placed for Lucca and the coastline at Viareggio but still found ourselves drawn back to Barga, even if only for the day. When we started to look in 2006 for a property we scoured the Serchio Valley, from Bagni Du Lucca in the south to Molazzana on the opposite side of the valley from Barga before settling for Casa Felice in the old town of Barga. (Barga Vecchia). One of the main reasons for choosing Casa Felice is that it is in the heart of Barga Vecchia (The old Town)and we can walk to the galleries, theatre and restaurants and it has a vibrant calendar of festas throughout the year including a chocolate festival in December. Despite having all that choice the location is quiet and surrounded by many local residents of Barga. We also find Barga well positioned for day trips to the beach at Lido Di Camaiore or Viareggio and offers excellent public transport links (Bus and Train) to Lucca and Pisa. In short it offers a choice of lifestyle, ranging from living in a village and being able to walk to all amenities, or explore the towns and villages of Northern Tuscany all set within spectacular scenery and literally adjacent our home. Bathroom has floor and wall tiles and has bath and over bath shower & screen, bidet, wc, and feature vanity unit with inbuilt storage and large illuminated mirror. The lounge has a modern sofa with slumber cushions a single chair and a drop leaf table for indoor dining in the winter. iPod dock, DVD player and 32" TV (Italian TV) . Feature fireplace with open hearth. There are ample wall and floor standing storage units with integrated oven, hob, sink, toaster, fridge and freezer. There are granite worktops and the kitchen is fully equipped with crockery, cutlery, glasses bottle openers etc. There are several small skiing ares within a 45 minute drive. The popular and well sign posted Abetone ski resort with its many lifts is just overan hours drive. A 6 hole golf course is available within half an hour. Notes on accommodation: The property is painted in Italian style with fresh tuscan colours and is accessed from the dining terrace which leads directly into the lounge which has feature fireplace and large window with superb outlook. The modern kitchen is off the lounge, is compact but well appointed with fridge freezer oven and hob. The flooring in the lounge and kitchen is marble. The property is split level with three steps leading to a lower hallway with access to bathroom and two bedrooms. The bathroom is tiled and has a feature vanity unit with large illuminated mirror, wc, bidet, bath with telephone style hand held shower attachment. The master bedroom has a large oak in-built wardrobe with ample drawers. The second bedroom has free standing storage with ample hanging space .Both bedrooms have attractive parquet flooring. The property is cool in the summer and benefits full Gas Ch to keep you warm in the winter along with an open fire. Outside: Casa Felice is uniquely located within Parco San Felice, which in effect is the communal garden grounds of the San Felice Church. Access to the property is from Via della Misericordia opposite Casa Fontana (B&B) through a gate into a large paved patio where you can find a band playing during Festa Centro Storico. A couple of steps up from this patio is a small metal gate, which gives access to our lower grassed terrace which is ideal for those who wish to relax reading a book. Terracotta steps lead to the main terrace which has a patio table, parasol and four chairs and has open views up towards the Duomo. Adacent this terrace is a mature pergola and path and steps leading to a viewpoint overlooking the adjacent countryside towards Tiglio. Overnight parking in Barga Vecchia is restricted to residents and is due to its narrow lanes is only for the confident. Free parking can be found at the Acquedotto a 5 minute walk from Casa Felice Utility Room: There is a walk in utility cupboard off the master bedroom where we store the parasol,steps,iron/ironing board, spare light bulbs, tool kit, mops etc. The washing machine is located here. Cleaning / Towels / Linen / Maid service: Towels and bedlinen are included and the property will be cleaned before arrival and on departure. Additional cleaning for stays of 2 weeks or longer can be provided at a supplemental cost. My wife and I were really pleased we booked this property. It have everything we needed and more. On arrival we found some wine, soft drinks and some other essentials available. The property operates a policy of, replace what you use with something else, which works well. The living room is comfortable, so are the beds, the kitchen had everything we needed and you don't need to take adapters if coming from the UK - there are plenty of them. The property is one of few, I believe, that has outside space in old Barga. It is wonderful to sit out to enjoy the sun, have a beer or eat a meal. There are plenty or restaurants close by, but don't miss out on going to Alpino Restaurant in the newer part of town - but it is actually one of the older building in Barga. Of the five restaurants we visited, Alpino's food was the best. Barga is a great location for the Alpi Apuane. going cycling and walking. Some of the views are spectacular, and that includes from Barga. Some people may be put off by the lack of air-conditioning, but don't be. When we were there it was well over 30 and it was still cool enough in the apartment - you just have to open the windows and make sure the shutters shut out the direct sun. I'm glad you enjoyed our little Tuscan paradise and appreciated the reasons why we chose this particular property within the walled city of Barga. The choice of restaurants, all within walking ditsance is fairly unique, and we know we are spoiled by its many culinary offerings. Loved the Church piazza and outdoor space, although when the Piazzetta is on it can be a little intrusive if you wish to sit and chill! We loved our stay in beautiful Barga and found the apartment very comfortable,well equipped and with beautiful views over the rooftops and countryside.It is in a lovely private location with lots of outside seating options while still being within easy walking distance of all Bargas attractions,restaurants and bars. Barga is quite stunning with its cobbled narrow paths and lanes and bright flower pots around every corner.Views from the Duomo are not to be missed ,even if it rains! We visited Florence by train and Lucca by car ,all very reachable for a great day out. The charm ,character and beauty of Barga will see us return again soon when we hope the apartment will be free. We're glad you enjoyed our little oasis and more importantly enjoyed Barga and experienced some of the many things to do in this hidden gem tucked away in Northern Tuscany. Nette Ferienwohnung in zentraler Lage ! Wir waren mit 2 Personen dort, Wohnung ist aber auch für 3 Betten ausgelegt. Liegt toll zentral in der wunderschönen Innenstadt Barga mit seinen gemütlichen Plätzen, zwar nahe am Dom, aber das Glockengeläut hat uns nicht gestört. Sein Auto parkt man am besten 300m außerhalb, aber alles kein Problem. Ein bißchen laufen schadet ja nix. Der Vermieter hat alle unsere Rückfragen superschnell und angenehm beantwortet. The Alpi Apuane national mountain park with its many kilometers of maintained tracks is renowned for its hiking, trekking and panoramic views. Classes can be arranged in Art and inspiration, creative writing, gastronomia, Italian Classes, Mind and Body, Music and Performance and Outdoor Adventures. The famous beaches of Versilia lie just beyond the coastal mountain range and can be reached by an attractive drive through one of the passes or via Lucca. Viareggio and Lido di Camiore are nearest and can be reached in about an hour by car. Within a further quarter of an hour are the picturesque town and coastal resort of Pietrasanta and the chic and fashionable shops and beaches of Forte dei Marmi. The main airport is Pisa, about 75 mins by car, and served by Ryanair from Stansted, Edinburgh and Prestwick. BA and Easyjet fly from Gatwick to Pisa,with Jet2 from Leeds Bradford and Edinburgh - Pisa. The Serchio Valley line connects Barga to the main rail network of Italy. There is a bus service from Barga to Lucca, Castelnuovo and surrounding towns and villages. Florence about 60 miles, Lucca about 20 miles, Pisa about 30 miles. The Chianti region, Siena and San Gimignano are within an easy days drive as are Genoa and the dramatic coastline of the Cinque Terre. Casa Felice is well located within Barga allowing you to walk to shops, bars, restaurants, banks and all facilities available in the town, (including an Olympic size pool complex). After a day sightseeing or at the beach, the visitor can stroll for an aperitivo at a local bar and have dinner thereafter without having to resort to the car. A flavour of daily life and all the activities on offer can be found in the excellent community website. Barga is ideal for those looking for the unique experience of living in a small medieval town with a peaceful environment but with a lively programme of activities. 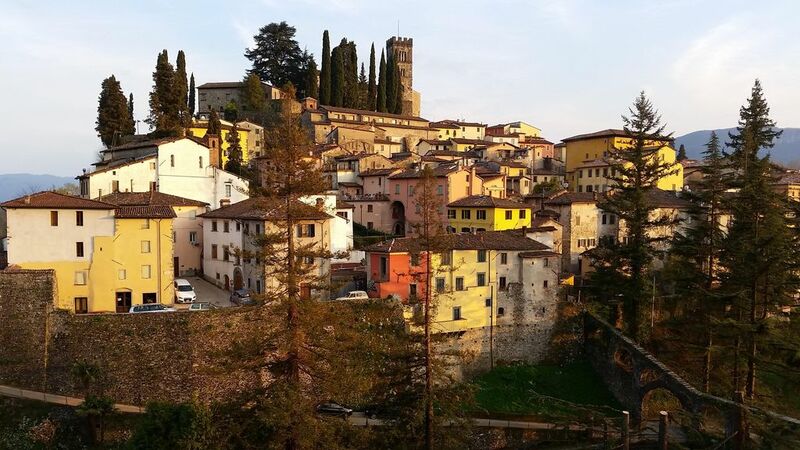 Barga has it’s own 18th century theatre and is renowned for its summer opera and jazz festivals. The restaurants of the area offer traditional Tuscan food and wines at easily affordable prices for the family. Booking Notes: To confirm a booking a deposit of 50% of the total price is required with the balance payable 8 weeks before departure. If you book within 8 weeks of departure the full price is payable. Cancellation must be made in writing with cancellation charge being the full deposit if you cancel more than 8 weeks before departure. Less than 8 weeks but more than 4 weeks before departure – 70% of the price. Less than 4 weeks – 100% of the price. Notes on prices: Prices for the property are per week and in British Pounds Sterling. Discounts available for over a week or long winter lets and special rates on request for long week-ends. Generally Saturday to Saturday but flexible subject to availability.